A couple months ago I was contacted by Camelbak to do a review of one of their products. If you know me, you know I LOVE me some reusable bottles (my overflowing cabinets can echo this claim), so I jumped at the opportunity! I was stoked when a box arrived at my doorstep and it had, not one, but TWO of the new Camelbak Chute® Vacuum Insulated Stainless bottles! I received the 20 ounce in Jet and the 40 ounce in Evergreen. Is it just me or does the Evergreen color remind you of the old school thermoses? Obviously as soon as they arrived we had to bust them out and see how they worked. There were a ton of features that I was stoked to try out - the fact that they stay cold for super long (24 hours for the 20 ounce bottle and 48 hours for the 40 ounce bottle), that you can put hot beverages in them (and they stay warm for 6 hours), that the cap snaps into the handle (so it doesn't get in the way when you are drinking OR misplace it ;)), that they have a sturdy, double-walled steel design which keeps condensation from collecting on the sides of the bottle, that the lid has a carry handle, etc. The cap stows in the handle - how convenient! The two-finger carry handle is oh so comfortable! As soon as I saw these water bottles I knew they would be perfect for hiking and camping (and if you know us, you know we love to do all that outdoorsy stuff)! After all, nobody wants to end a long, hard day with a lukewarm drink. 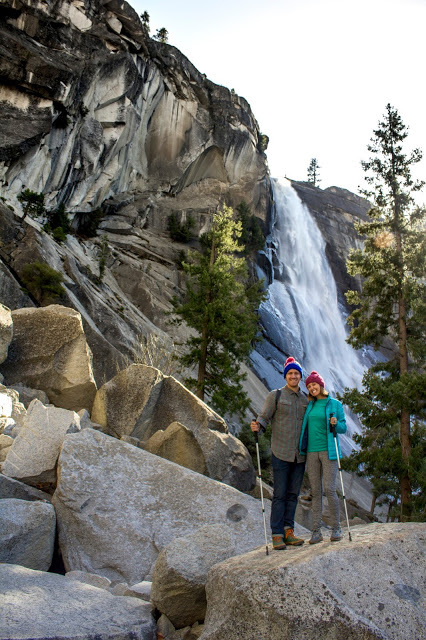 The 40 ounce Camelbak Chute® Vacuum Insulated Stainless bottle is perfect for long hikes (like our hike to Vernal and Nevada Falls in Yosemite that conquered did this past week) or even for sharing (four-legged hiking partners included). Also, when you are camping in places that drinking water isn't readily available, this is a great option to store a large amount of agua. And even though it holds quite a bit of liquid, I didn't find it too cumbersome to carry around. I love the two finger carry handle (I can fit 3 or 4 of mine in there ;)) that is obviously designed with comfort in mind! Walt was licking his chops to get some of the chilled water! Walt gets a sip, then I get a sip... It's how sharing works! Even when I'm chilly and need extra layers, my hot cocoa stays hot! Both the hubby and I are stoked to take these on future adventures (I've already had to tell him to keep his paws off or else he may commandeer them as his own). They keep cold beverages cold and warm drinks warm, no matter what's going on outside... that, along with the countless other awesome features, helps to give these TWO THUMBS UP!